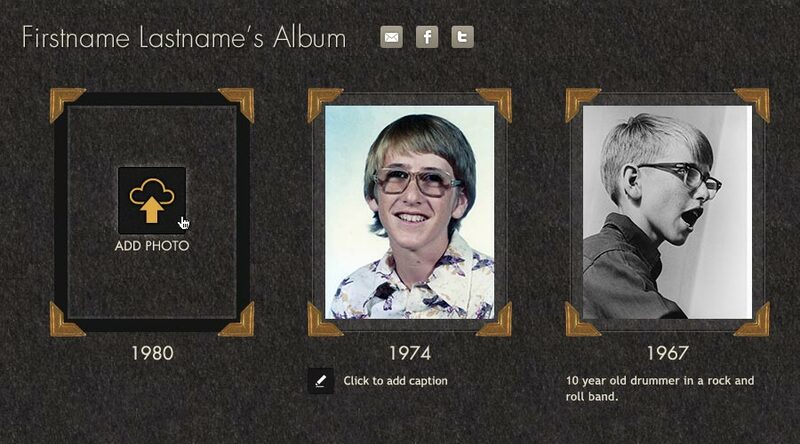 YearlyMe allows you to create and share a photo album containing one photo from each year of your life. Get started with your album by following these simple steps. We need to know a few things about you to create your account: First Name, Last Name, User Name, email address, password and your birth year. Your birth year is used to set the start date of your YearlyMe photo collection. You may alternatively choose to sign up with Facebook. We will only ask for information usable on our site, and will never provide your information to any third party. NOTE: When you’re setting up your account, just check the box that says "Make my photo collection private" if you prefer that your photo collection only be visible to you. You can always change this later in Edit My Profile. 2) Start your photo collection. From your photo album view, click any blank year to open the photo upload tool. You can browse for photos on Your Computer or pick a photo from your Facebook or Google+ albums by clicking the Connect with Facebook or Select Google+ Album buttons. NOTE: You’ll need to allow YearlyMe to access to your social account when prompted in order to connect with Facebook/Google+. Once you’ve upload your photo, you can use the tools surrounding the photo in the album to move, edit or delete your photo or add a caption. 3) Share your photos with your friends on Facebook and Twitter. Use the Share buttons at the top of your album to share your entire album. Use the Facebook, Twitter and link icons surrounding a photo to share the photo on Facebook or Twitter or copy the photo’s URL to paste into email. Need to change your password or privacy settings? Select Edit My Profile from the menu to update your account details.